As I talked about on our Facebook page the other day, I was trying to figure out where to find patterns, fabric, ect for cloth diapers. I worked on my little experiment this week as I slowly figured out where to get the supplies. If anyone else is looking to make these I hope my little thoughts will help! First, I did check out a bunch of different patterns online. There are alot of free cloth diaper patterns out there, but my concern was that they were “OS” or one size. I really wanted to be able to make diapers in different sizes for a better fit. I ended up coming across this book and I’m so glad I found it! 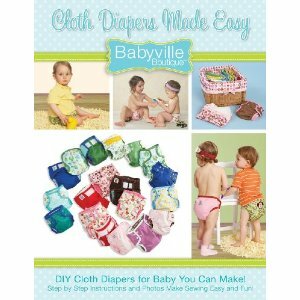 Cloth Diapers Made Easy was just the book that I needed. Not only does it have patterns for all sizes of cloth diapers from newborn to large, but it has step by step picture instructions! I was worried that making the diapers would be complicated but I’m so glad I got this book because it was so much easier than I thought! For my diaper I used PUL fabric for the outside, which I finally found at Hobby Lobby. (Do NOT order it online if you can help it…it’s so much cheaper in the store and you can use coupons at Hobby Lobby!) 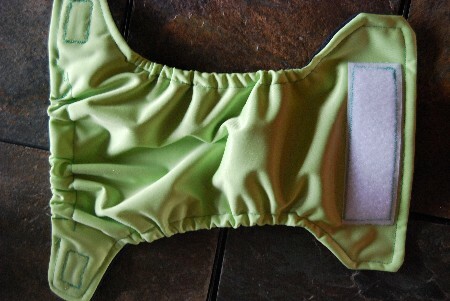 PUL is a waterproof fabric, perfect for diaper making! Hobby Lobby had some options on fancy elastic but I just stuck with ¼ in. braided plain elastic for now and it worked just fine. For the inside I chose butter suede that I found at Hancock Fabrics. It was fairly inexpensive and I was glad to find colors inside of white to avoid too much staining. Butter Suede is a little thinner and stretchier than regular suede. It’s supposed to wick away the moisture so it goes into the soaker layer inside of staying in the diaper. I messed up the Velcro when I put it together and I decided to tear it back out and fix it rather than waste all my work and start over. So my diaper has a little bit of a messed up front but it shouldn’t affect it and I still think it’s not too bad for my first cloth diaper! Using the book I picked up I should be able to easily make all the cloth diapers we will need! This is exactly what I have been looking for, thanks for posting. This thing looks HUGE! 😀 Nice work! How long did it take you, including the stitch ripping? Lol, that’s actually the newborn size for 6-10 pounds. It’s not as big as it looks:) It took me about 3 hours total I would say. But the seam ripping took forever! My concern would be that the ammonia in the urine would cause the dye to bleed onto the baby’s skin. I don’t know that would happen but I would maybe wash it a few times to make sure all the extra dye fades out. What did you use for the inside fabric? Flannel? Looks great. Wish there’s been such things available when I had babies, haven’t had any in 21 yrs. You did a great job and looks great for your first. Sometimes my first of stuff doesn’t turn out usable. LOL GReat help for others I’m sure. How much did one diaper cost to make? By the way, Hangin them in the sun will bleach out any stains. My cousin use to rub hers with Salt and Lemon and then hang them in the sun and the stains just disappear. 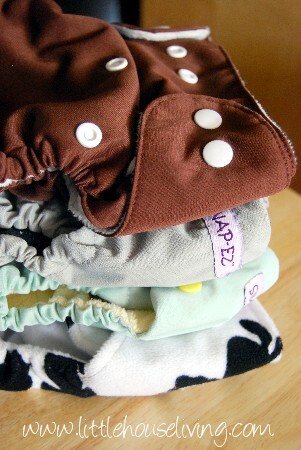 I am getting tempted to try cloth diapers again (we are due with our 7th here soon). I am so tired of buying diapers!!! If I had to guess I would say less than $2. 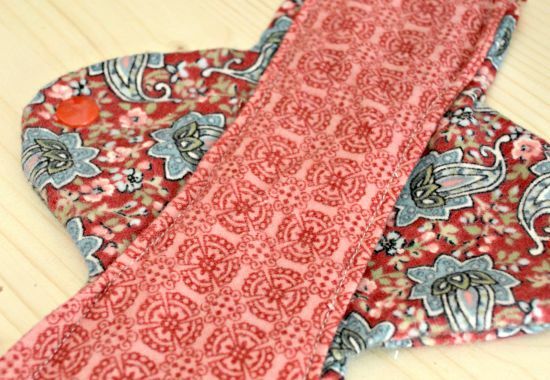 I paid $6.50 for 1/2 yard of PUL which I think should make at least 5-6 diapers. The butter suede was $6 for a yard which should make me around 10 diapers. And the cost for the thread and the elastic was minimal. However I will also have the cost of the insert but that should be cheap to make or around $1 to buy. Have you used it yet? I suppose you want to make more before you start using them? No I haven’t used it yet but I will this week. I just need to get a bit more organized for my cloth diapering and I’ll be set to go! 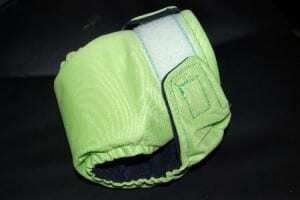 I’ve recently seen PUL at Jo-Ann’s too – along with colored velcro and the nylon snaps – CUTE patterns on the PUL too! Does this book have patterns for diaper covers? I’d like to use covers and prefolds instead of the pocket style but I’m having a hard time finding a pattern or instructions for the covers. Yes it does. I think there was at least 2 different cover patterns. I have just bought this book, but I haven’t tried it yet. 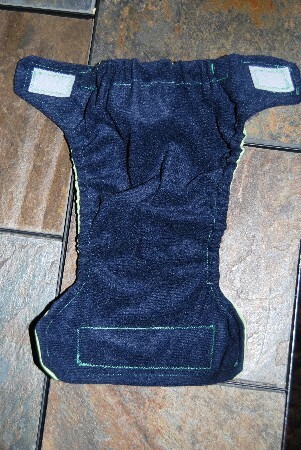 I have however, made two other pocket diapers using a pattern I downloaded off the internet. I have been cloth diapering my baby since she was 3 weeks old, so about 9 weeks (we’re still newbies), but let me say, I LOVE it. I will NEVER use disposables at all. Just a note, you shouldn’t have to wash the diaper covers, or just the pocket diaper 3 times. You should only have to wash it once. Make sure you also dry it in the dryer ONE TIME to seal any holes from sewing. Otherwise you get leaks (Trust me, I know). You can dry the diaper in the dryer every time you wash it, however since that’s going to be around 3 times a week, it will shorten the life of your diaper. Just an FYI! Have fun cloth diapering! It can be addicting!!! 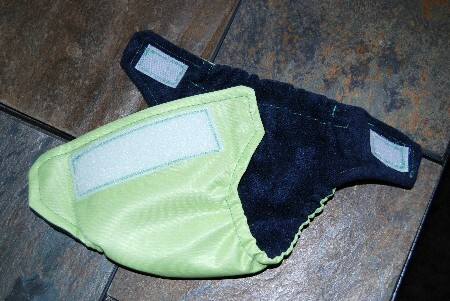 When I had my daughter almost a year ago, I looked into possibly making my own pocket diapers. I too looked at all the free patterns and couldn’t find one I liked. I definitely want to get this book and try since I’m due in June! Yes, this project was easy. I would consider myself an expert sewer by any means and I did it! I was wondering if you still use cloth diapers and if there is anything you have learned about them (buying, making, using) since your article about making them. I have a 3 month old and am still using up the disposable diapers from my shower but I’m considering switching to cloth when they run out. Yes we do still cloth diaper. Here’s a little more about what we are using now: https://www.littlehouseliving.com/frugal-cloth-diapering.html I ended up not being very good at making them and preferred buying instead. I got the same book maybe a month or so before my son was born, I had ordered a variety of diapers to try and my mom ended up sewing size mediums for me when my son was a few months old, I did not start cloth diapering right away but if I end up having another I will cloth diaper at the beginning, we ended up using mostly g-diapers and I currently just went back to cloth diapering part time after giving up for about 6 months because we needed new sizes and other family members were not on board (I am not a stay at home mom). I would like to be a stay at home mom if we have another but we will see what happens, all the diapers we did buy or make were made gender neutral and I have even loaned them out to my babysitter to use for awhile. 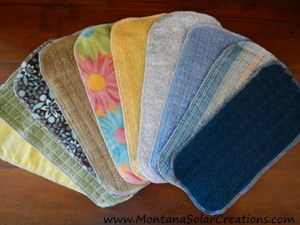 Cloth wipes I ended up making and keep getting out of the habit of using them (not for diaper changes anymore) all those meal clean ups and whatnot and that was the easiest sewing I did, used sewing machine on some and surger on others and both were great. Love reading your posts. I am a farm girl from Montana, so excited to see and hear of the lifestyle I grew up with. Your doing a great work.